Ts'yl-os Provincial Park (pronounced sigh-loss and which can also be spelled Ts'il-os), means the man who became a mountain. This majestic British Columbia provincial park protects a very special landscape and a number of vulnerable wildlife species, like Grizzlies and Bighorn Sheep. Ts'yl-os was designated as a provincial park in January 1994. The sixth largest provincial park in British Columbia (nearly half the size of Prince Edward Island), the 233,240 hectare area encompasses Chilko Lake, which hosts the third largest sockeye salmon run in the province. Ts'yl-os Provincial Park is located 100 miles (160 km) southwest of Williams Lake off the Bella Coola Highway 20. Please note that travel time varies considerably depending on weather conditions. Routes follow rough, washboard gravel roads; high clearance four-wheel drive vehicles are recommended. 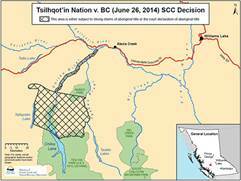 On June 26, 2014, the Supreme Court of Canada (SCC) granted the Tsilhqot�in Nation a declaration of aboriginal title. Aboriginal title includes the right to exclusive use and occupation of the land, as well as the ability to determine the uses to which the land will be put. The map below shows the land that is subject to the declaration of aboriginal title. 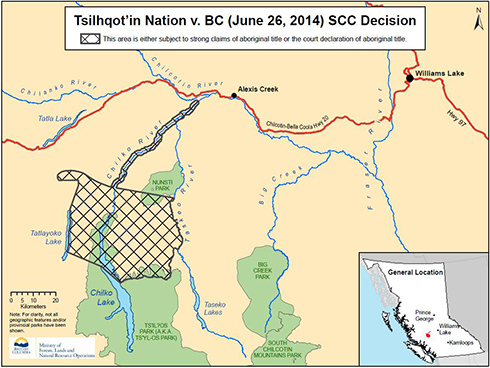 The Province is currently analyzing the SCC�s decision, and is in dialogue with the Tsilhqot�in Nation about access to Tsilhqot�in title land. Until further notice, persons interested in access to the Title area for camping and associated recreational activities are encouraged to contact the Tsilhqot�in National Government (http://www.tsilhqotin.ca/index.htm). The spectacular scenery and wilderness setting of Ts'yl-os Provincial Park makes this area particularly appealing to recreationalists and to the wilderness tourism industry. Chilko Lake is a challenge for experienced boaters. However, canoeing, ocean-type kayaking, power boating, fishing, sightseeing and windsurfing are enjoyed by many visitors. The surrounding mountains provide a high quality wilderness experience and offer opportunities for wilderness hiking, mountaineering and horseback riding. Twenty lodges or camps operating around the periphery of the area offer outdoor adventure trips around Chilko Lake with minimal disturbance to the environment. Ts'il-os is the scenic focal point from the Nemiah Valley and the highest point in the Chilcotin Range. It features extensive alpine meadows, snow fields, tarns and sub-alpine regions. Chilko Lake is an outstanding picturesque feature, with its distinctive blue waters, large size and mountainous setting. On the lake itself, there are uncommon freshwater lagoons and volcanic dyke formations. There are five glaciers at the headwaters of the Tchaikazan River, which also features extensive meadows, outwash plains, spruce forests, a waterfall and a braided river. The area includes portions of the Interior Douglas-fir, Coastal Western Hemlock, Montana Spruce, Engelmann Spruce-Sub-alpine Fir, Alpine Tundra and Sub-Boreal Pine Spruce biogeoclimatic zones. Subzones of these biogeoclimatic zones within the Chilko Lake area are not widely represented in other parts of B.C. Plant life ranges from dry grasses and old-growth Douglas-Fir to Western hemlock and Western red cedar to Spruce, Pine and heather'sto lichens, kinnikinnick and feather mosses, with a number of rare and uncommon plants. Chilko Lake has the third largest Sockeye Salmon escapement in the province. A number of ecologically sensitive species occur in the area, including Grizzly Bear, Fisher, Wolverine, Bald Eagle and Dolly Varden Char. Although the wildlife inventory is incomplete, other vulnerable species likely occurring in the area include Peregrine Falcon, Vaux's Swift and Townsend's big-eared bat.